Posted November 30, 2015 by Heather Michet & filed under DIY, Essential Oils, Recipes. Earl Grey is one of my favorite teas. Being a bit caffeine sensitive, I usually make mine with Rooibos as the “tea” instead of the traditional Black Ceylon. which is derived from the Bergamot orange Citrus bergamia, a fragrant fruit the size of an orange, with a yellow color. For 1, 12 oz. beverage, place 1 tea bag or 1 tsp. of black tea in a tea infuser into mug. 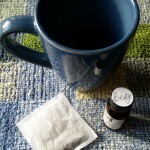 Add 4 drops* of pure Bergamot essential oil to bag or tea leaves in infuser. Pour boiling water into mug and let steep 5 minutes. Remove tea bag or infuser. Add milk and/or sugar if desired. *Adjust the number of drops of essential oil to suit your taste. Now sit back in that comfy chair, pull up your blanket and sip on this great cup of tea as you relax by the fire. Ahhhh.